In recent years I have pondered these questions as a result of some client discussions and related pieces of work. In general conversation I often find these terms used interchangeably and/or spoken about in conjunction with such things as high performing teams, improving staff/culture survey results, working on values and behaviours etc. As I have worked with clients on these issues, I have sought to provide some clarity about these concepts, usually just through exploration and conversation with them. Organisational culture is often described as the way we do things around here – the behaviours and actions that are valued, whereas organisational climate might refer more to the mood of the organisation – is it a healthy work environment where people can bring their best selves? Is that sufficient a distinction, though? There might be a reasonable argument to suggest those two things are still pretty similar. So let me take it is few steps further by suggesting a couple of other possible distinguishing features. What is the culture that we need that will support our strategic direction? Rather than the idea of having a good/bad culture, it is more about the idea of having the right (strategically aligned) culture – the culture we need to support our strategy. Is it a workplace where people can thrive and perform at their best? So, when we talk about organisational culture, there are critical choices to be made. One of the most important things to do is describe the type of culture we need to support our strategic directions. Typical cultures might be described in terms of one or a combination of the following themes – achievement oriented, customer-focused, collaborative, innovative, people-first or socially responsible¹. Organisational values are then articulated that embody the desired culture. It is not unusual to see organisations inadvertently communicating messages that are inconsistent with their desired culture e.g. an organisation that preaches collaboration but measures and rewards individual performance, maintaining pidgeon holes and in-trays while requiring people use sophisticated electronic document management systems, professing innovation while requiring monthly reporting on output targets etc. No doubt, many of you will be smiling to yourself and you recognise these types of inconsistencies. Culture management requires a planned and consistent approach. feel supported, valued and safe. Management of organisational climate is a critical leadership and management task, particularly at the local level in divisions, branches and teams, through the day-to-day interactions of leaders with their teams. These suggested distinctions between organisational culture and climate are not intended to imply, however, that they are mutually exclusive in nature. Clearly effective management of the organisational culture will have likely consequent positive impacts on organisational climate and visa versa. However managing one does not necessarily lead to the other. It begs the question, how dependent are they on each other? Can you successfully develop a desired organisational culture with a poor organisational climate? Highly unlikely I would have thought. Can you develop a good organisational climate without clarity as to the desired organisational culture? To some extent I think it is possible, but maybe a bit limited or unsustainable. 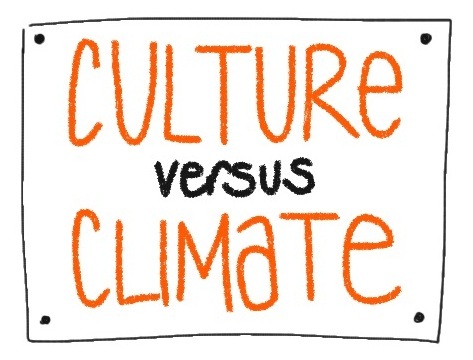 So, does the distinction between organisational culture and climate matter? Yes, I believe it does. Firstly knowing which you are focusing on will impact the interventions or strategies that need to be pursued. 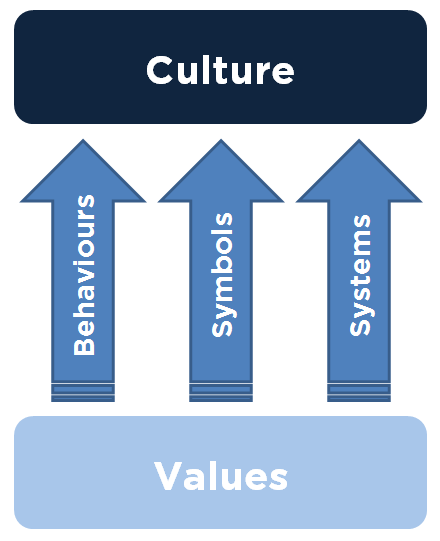 Working on culture will necessitate developing a clear organisation strategy; articulating the required culture to support that strategy and then planning; implementing; and actively managing the behaviours, symbols and systems that will drive creation of that culture. Working on organisational climate will likely involve actively developing leadership and management capabilities throughout the organisation, undertaking team development and ensuring accountability for effective people leadership and management. These are different, although related activities. Of course, there is no reason not to work on both! Secondly, it may influence where you prioritise effort. If you know that you have a poor organisational climate, then it may be necessary to invest in developing a more positive organisational climate before embarking on significant culture work. Thirdly, to help you understand whether you are measuring culture or climate through staff surveys. It is commonplace for organisations to run staff surveys. These go under various guises – culture survey, staff satisfaction survey, engagement survey, climate survey, pulse survey etc. It is important to look carefully at the questions in these surveys and the data generated as to whether they are fundamentally measuring your organisation culture or organisation climate. The answer to that question is pretty important in considering how to act on survey results. So, that is my take on culture versus climate. No doubt others will have differing views, however I believe it is useful to bring some more discipline to the language about these concepts. This post may have challenged your thinking, provided greater clarity to your thinking or just raised more questions than answers. It may just provide an opportunity, when culture or climate is next being discussed in your organisation, to bring more insight to these conversations. ¹ This discussion on typical organisational cultures and the importance of messages sent through behaviours, symbols and systems is drawn from the fabulous work of Carolyn Taylor, author of Walk the Talk. To find out more, following this link to the Walk the Talk website.